The weather here feels oppressively humid and hot with not a single breeze stirring. Each afternoon there are dark thunderheads and rumbles of thunder but they pass away to the mountains in the north without dropping any rain here. Today was a new adventure for me. I went shopping with Marie. To get to the market one needs to take a taxi. 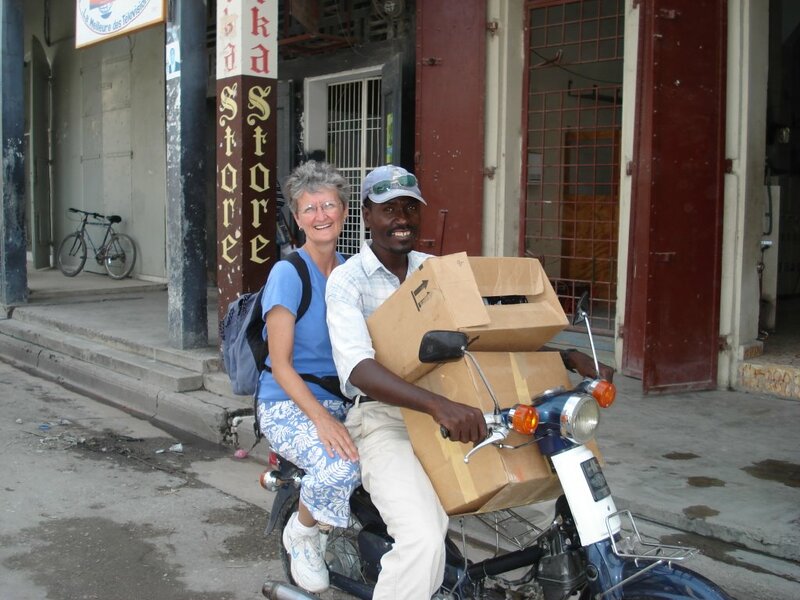 In Haiti a taxi is a small motor scooter or small motorcycle; no Harleys here. One phones up a taxi and they come pick you up. You hop on the back and off you go. I preferred not to look where we were going; the view ahead was just too scary with trucks, cars, bicycles and motorcycles careening toward us. There is no center line. The whole road is open to all. Everyone veers wildly ahead, around other bicycles, people walking, kids on bicycles on their way to school, etc. And horns are blaring the whole time. The market – There are actually 3 of them. We went to the food market. 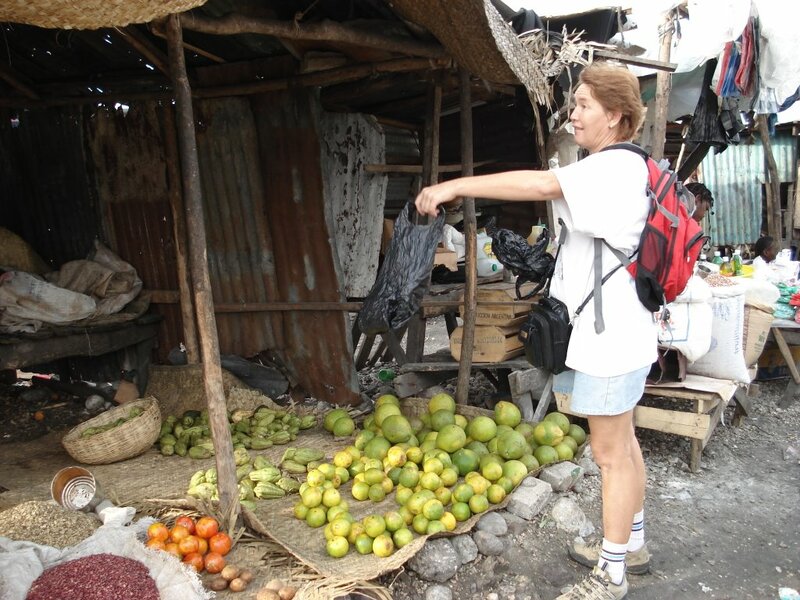 If you’ve been to Haiti, the place looks like the markets in Carrefour. Dirty gray slimy mud with standing water and garbage on the ground – definitely not a sandals type of place. Each vendor has their own five foot square patch of ground covered with a woven palm mat, and maybe a tin roof. Marie has her own favorite vendors for fruit, hot peppers, onions, flour, carrots, pumpkins, potatoes, beets, chicken parts (from the US of course), pork (whole pigs lying there cut up head and all), rice, beans, etc. Each product is sold by a separate vendor. She has to bargain a little; but most of them know her now and are pretty fair with her and don’t take advantage of her being a “blan”. At the market I took lots of photos of the vendors and they each wanted a copy. We had quite a crowd around us looking at the photos and wanting one of themselves. I’ll print them up and mail them back to Marie later. Maybe they’ll give her a discount. When we shopped we loaded all of the items into plastic bags we’d brought, then into our backpacks and carried them back to our taxis where the taxi guys put them into cardboard boxes we’d brought along. Then off to the next market for eggs, bread, and bananas. Following that we rode the taxis to an indoor market – similar to one of our convenience stores where you can buy canned milk, butter, cheese, canned veggies, cookies, soda, rum, wine, toilet paper etc. Not a whole lot of stock, but enough to serve their clientele. They were selling yellow delicious apples from the US – quite a treat here and only affordable one at a time. Next to the bank where Marie cashed a check, then we went to the “drive up” bank where I changed money. One does that by driving up to a street corner where three or 4 guys hang out to change money. It’s a better rate than the banks will give you. The current rate is 38 or 39 gourdes to a US dollar; when we came 4 years ago it was 44 gourdes to a dollar. Finally, fully loaded we careened back home. My driver, Jocelyn, had two large boxes in front of him, me on the back with a fully loaded backpack and a sack in my left hand. Marie had the bread, crate of eggs, sacks of flour and another box on her taxi. We got back to the university in time for the cook, Milous, to make lunch. We all eat a large hot meal at 12:30 and then the leftovers are dinner. Today was rice with bean sauce (diri avek bwa), chicken, and a fresh salad of iceberg lettuce and tomatoes. Also a yummy hot beet and potato dish. They eat lots of beets here. This afternoon I was hit with nausea and diarrhea – who knows what from. But one is not surprised when it does hit while visiting Haiti. At least here at AUC we have electricity most of the time (i.e., fans to cool us down) and showers (to wash off the sweat and grime from the taxi ride). I felt poor enough by 4 p.m. that Paul went and lead the bible study by himself. When he came back he said the students had been very enthusiastic...some of them had evening classes, so the attendance was fewer. One of the teachers reported that students kept looking at their watches and when break arrived they beat it out the door to our bible study to sit in for 10 minutes here and there when they could. Isn't that exciting? Yesterday we found out that a local Haitian man that Kelly had been treating had died. He was young (30’s?) with a giant (football-sized) open tumor behind his left ear. I can’t describe it adequately except to say it was bloody and scabby and multi-colored. He bled to death yesterday when the tumor finally ate through a vein. Kelly took Mark to treat him on Sunday; Mark gave him as much pain meds as he dared. There was nothing else to do. When Jean originally went to the doctor here with a small bump, they told him it was nothing and not to worry about it. Kelly (and Mark) was the only one who would have anything to do with him. He had been living in a one-room building behind his sister’s house.